Today, organizations are responding to market demands and regulatory requirements faster than ever by extending their applications and data to new digital applications. This drive to deliver new functions at speed has paved the way for a huge growth in cloud and microservices applications, such as those hosted in IBM® Cloud. One of the most widely adopted ways to integrate cloud applications with enterprise application logic and business data is the use of application programming interfaces (APIs). By extending enterprise applications to form a hybrid cloud environment, you can capitalize on investments in on-premises services whilst taking advantage of the benefits of public cloud services. Over 90% of new client-facing apps rely on application logic and data services from mainframes, meaning IBM Z® is a critical service provider for cloud applications; for example, through REST APIs. These same APIs can be used through other channels and applications on-premises and in the cloud. Many technologies and solutions can be used to enable cloud integration with the mainframe, including web APIs, services, connectors, messaging, and so on. The primary goal of this IBM Redpaper™ publication is to help IT architects choose between the many application integration architectures and solutions and make the best choice based on the specific requirements of the project. This paper outlines some of the business imperatives and challenges. Then, it reviews the main architecture options and the key considerations for planning API-enablement of the mainframe and provides guidance for when to use specific solutions. 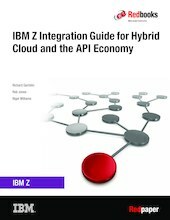 Finally, it documents several API integration scenarios to show how these technologies are used in the real world.